This classic dish complements pork, poultry, beef or fish. Try pine nuts in place of the almonds or substitute wedges of fresh tomato for the lemon juice to add an extra pop of color. Fill a large pot with water and a generous pinch of salt, then bring to a boil. 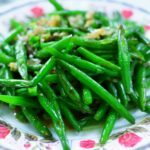 Add the green beans and blanch for 2 to 3 minutes; beans should be crisp and bright green. Remove from heat, drain and set aside. Toast the almonds in a skillet over medium heat, stirring constantly until golden brown, about 5 minutes. Remove almonds from heat and set aside. Add the butter to the skillet and sauté the garlic over low heat until slightly golden, then stir in the almonds, lemon juice, salt and black pepper. Add the green beans and toss to mix well. Serve hot.